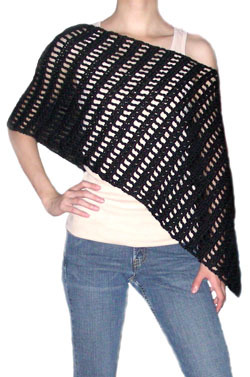 Crochet this poncho to wear during winter or cool summer nights. The pattern is a simple and easy, repetitive pattern to crochet and includes instructions for customizing the poncho’s size so that it fits you exactly the way you want it. To download pattern, visit the Crochet Spot Store. New users may create a new account, while existing store shoppers may log in using their email address and password. Once logged in, you may add the pattern to your shopping cart and check out. If you are a Premium Pattern Member, you may download this pattern for free! Need help while crocheting your poncho? No worries, just ask for help! This entry was posted on Sunday, July 11th, 2010 at 1:00 PM by Rachel Choi	and is filed under Best Crochet Patterns. You can follow any responses to this entry through the RSS 2.0 feed. You can leave a response, or trackback from your own site. …just purchased my first crochet spot pattern…can’t wait to start making this…i ♥♥♥♥ this pattern…thanks Rachel!!! This is cuuuute! I may just have to buy this one. You go, girl!! I found this picture yesterday and have been here looking at it because I want to make it! Its so cute!